When a new scientist embarks on a career in the lab there is a lot they need to take on board. To contribute to our understanding of diseases like Alzheimer’s, PhD students need to learn how to design and run experiments, analyse results, and effectively share their findings with the wider research community, all while keeping up with the latest research developments in a fast-moving area of science. But often they are driven by their own personal experience of the disease they’re trying to solve. 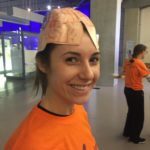 We caught up with Rebecca Gabriele, a second year PhD student at King’s College London, who explained how her own experience of dementia motivates her every day. So, what does your research focus on? My current research focuses on understanding the function of a protein called BIN1, in Alzheimer’s disease. BIN1 is a genetic risk factor for Alzheimer’s which means that some forms of BIN1 can increase the risk of developing the disease. My work, which is funded by Alzheimer’s Research UK, is teasing apart this relationship between BIN1 and the unfolded protein response. I hope that what I learn through my studies will help shape the search for future treatments for the disease. Why is this area of research so important? Alzheimer’s disease can be a catastrophic diagnosis that affects not only the individual but also their family, friends as well as wider members of society. I am committed to help finding a cure and the first step towards conquering the disease is to fully understand how and why it occurs. I believe that a comprehensive understanding of the BIN1 protein could inform the development of therapies for Alzheimer’s. There are challenges in my work and I have learned that there will be many moments where you will feel stuck and things will not work out as you have planned. To get through, I try not to get to disappointed, I am positive and do not give up. What keeps you motivated to overcome these challenges? I have always been fascinated by the complexities of the brain and as an undergraduate in the US I discovered a passion for neuroscience. Remembering that the work I and other researchers do is extremely valuable and that you are actually helping people is a huge motivation. Like many others, I have personal experience of the condition. Every August since I was a little girl, my family has prepared tomato passata together with an older couple, Carolina and Domenico, and their family. This became a family tradition and I have wonderful memories of those summer days, especially as I have always considered Carolina and Domenico almost as my own grandparents. Unfortunately, our passata tradition is not the same anymore because Domenico is affected by an aggressive form of dementia and the “grandpa” I used to know is slowly disappearing. The same disease affected his sister and his mother before him and so he knew exactly what was going on when it first affected him. Despite this, Domenico has never given up. I remember that in the first stages of the disease, he would pull out from his pocket a folded piece of paper, his portable memories, and he would point at the words he could not remember when he wanted to tell me one of his stories. In the past few years Domenico’s condition has become more severe and now he is disoriented, confused and vulnerable most of the time. Knowing what dementia has done to Domenico, what it has stolen from him, makes me very sad but the memories I preciously preserve are a driving force in my research and I would like to do all I can to prevent anyone else from going through a similar experience. I want to be an agent for change, and I believe that the most practical help I can give is to be a dementia researcher. What’s one thing you love most about research? The best thing about being a scientist is that you are never bored, there is always something to learn and this keeps me engaged with my research. One of the things I love the most about being a researcher is the people I work with. To get through the challenges of my work it’s important to share your successes and your failures with people in the lab and be there for them to cheer them up and to celebrate accomplishments together. They play a huge role in making my journey as an early stage dementia researcher a memorable experience. In my opinion there’s not one single area of dementia research that holds the most promise. Collaboration with people with different expertise is essential to understand the different types of dementia. When I am not in the lab I love to go running, cooking and eating. A picture of my family because they are my courage and strength, a life-long supply of coffee, and my favourite book, Pride and Prejudice!